*full disclosure: an online screener of this film was provided by Vertical Entertainment. Cast: Lance Henriksen, Camille Balsamo, Matt Winston, Giovonnie Samuels and Winston James Francis. Harbinger Down was created by an experienced special effects crew. The director, Alec Gillis, has been associated with many sci-fi and horror films. 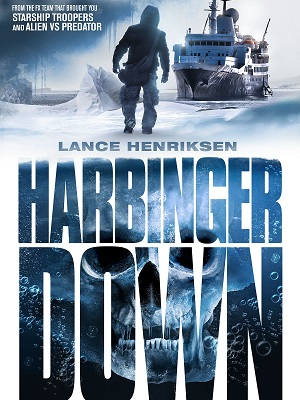 As well, Harbinger Down is Studio ADI's first attempt to bring an independent feature to screen, focusing on their practical special effects. Also, the film was funded through a Kickstarter crowdfunding campaign and over two hundred and fifty thousand dollars were raised. The results are slightly mixed. 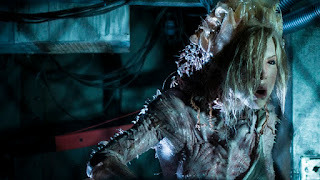 Many of the special effects look heavily influenced by a previous Studio ADI undertaking, The Thing (2011) and the film's story is also inspired by this earlier film. Lighting is minimalized to almost hide the monstrous creations. Meanwhile, the story struggles to find impact. Harbinger Down misses the mark on a couple of levels. Story can float or drown a film. Here, the story is slightly water-logged. A research team and a crabbing crew set out for the Arctic. They work together to pull a space relic, from the ocean. The relic is actually a Russian spacecraft and it is fully loaded with strange microbes. From the moon, these microbes devour anything within their reach. 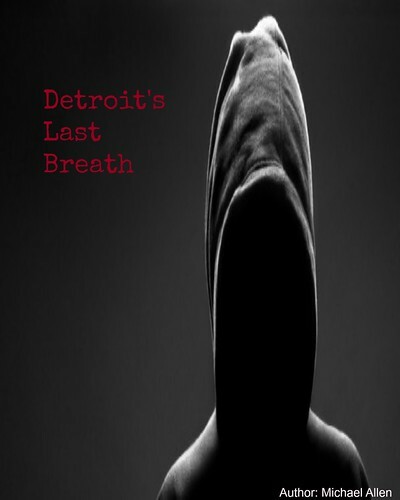 Characters are consumed, the lights dim and something lurks in that stinky bilge! But, there are few hiccups along the way. This image triggered one viewer's gag reflex. The lighting could have enhanced the creature effects. A blood red light brings a horrifying effect to an above deck scene. A creature goes up in flames and the red reflection, on the faces of the characters, shows the viewer the fiery outcome, indirectly; it would have been interesting to see more events take place like this one. Unfortunately, the lighting is limited, when the creature is onscreen. The lighting almost hides the monster. But, the growing parasite looks top notch and some vibrant lighting could have improved the film's affect. Also, everything grows darker as the film progresses. As events begin to climax, it is difficult to see what is happening. Lighting can amplify exciting scenes. In this film, the lighting is too dark, even considering the dire setting. Most of the special effects look great. Alec Gillis and others have created some great creature designs. For instance, one character is partially absorbed into the monster, but her visage and upper body are still visible. The outcome is unusually disturbing and very unnatural (seen above). The effects artists also skew perspective. Models are used to show the research ship, sailing through ice flows. Most of the models are miniatures. As well, the monster appears on deck, after escaping a lower hold. Even the monster's form is sometimes miniscule and amplified in size with camera tricks. These scenes appear effective and believable. Studio ADI knows how to focus on their strengths - creature design, but another film element suffers. The film's plot is remarkably similar to that of The Thing (2011). Both films take place in hostile, cold environments. Snow and ice are the order of the day. In addition, researchers are studying something below a surface layer of ice. What they discover is something of another world. Alec Gillis has cleverly re-written The Thing, another film he has worked upon and he has added very little of his own voice. But, the similarities continue on and on. The film's central antagonist is able to interact with DNA, in both films. In The Thing, the creature can hide within a body. In Harbinger Down, it absorbs the host's DNA and alters it. The monstrous result looks like some sort of creature melt. The results in both films are a cross between several distinct organisms. 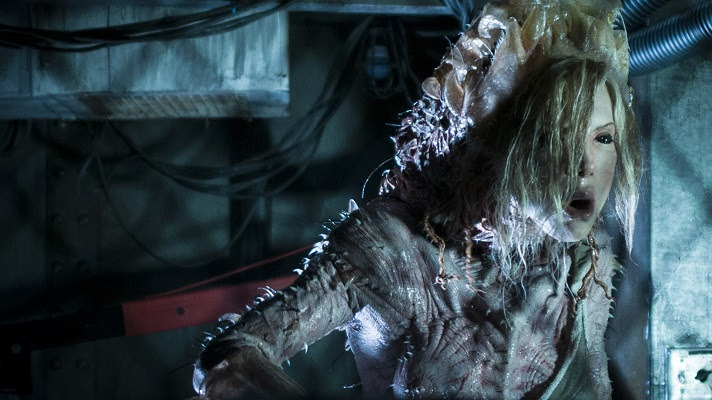 In actually, there are fewer story differences between The Thing and Harbinger Down, than there are similarities. 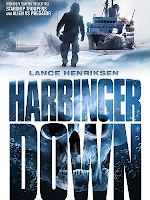 Harbinger Down is an effects focused film and the story is secondary. This film is actually a platform for the production studio to show their creative abilities and designs. However, the characters, plot and climax all feel underdone. The outcome is slightly disappointing. And, thrills are relegated to a few below deck scenes. Even actor Lance Henriksen's (Aliens) stony grimace cannot save this sinking ship. This critic would hope that a few viewers would not go down with the ship as Studio ADI continues to develop its own writing style. As it is, Harbinger Down is a dim, watery grave. Overall: 5.75 out of 10. *this film strongly reminded this viewer of still another, Millennium Bug (2011). Both films use forced perspective and predominantly practical special effects.